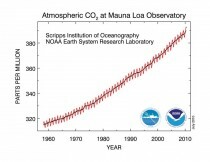 CO2 has been increasing since 1958 according to the measurements at Mauna Loa Observatory in Hawaii. In this analysis by Tom Quirk, a look inside the data suggests that the increase of CO2 in the atmosphere may not be from the CO2 derived from fossil fuels. His analysis concludes the increase in CO2 is driven by other processes related to the natural variability of the climate. There are many reasons to challenge the claims that CO2 is harmful and must be reduced through regulation or worse yet sequestration. All life forms on the planet - animal and plants are carbon based. They release and in the case of plant life utilize carbon dioxide. The average human emits 2.3 lbs of CO2 per day through respiration. Animal life likewise contributes. In most classrooms, auditoriums, workplaces, shopping malls, sport venues and other gathering places, CO2 concentrations are two to three times higher than the ambient (free air) levels of around 388 ppm. In submarines, the level may reach 20 to 40 times the ambient levels with no ill effects. 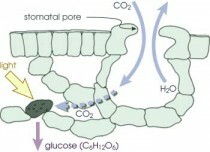 All plants require CO2 for photosynthesis and growth. The globe has benefited in recent decades from minor cyclical warming and increases in CO2. 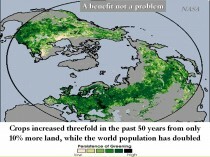 NASA estimated an increase of yields by 30% over 50 years with 10% more arable land due to increased CO2 and slight cyclical warming. Better hybrids, fertilization, pest and disease controls and irrigation each contribute, but CO2 is key to this agricultural revolution that has enabled us to feed many hundreds of millions more of the earth’s population. Many experiments in the laboratory and in the field (e.g with sugarcane in Brazil) have demonstrate this. CO2 enriched plants are more vigorous and drought resistant and have lower water irrigation needs. 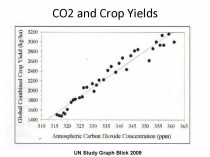 CO2 benefits crops under moisture stress most! 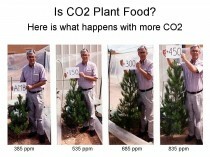 Nurseries pump CO2 into greenhouses to 1000 ppm to enhance plant growth. Yale professor Robert Mendehlson testified to congress in 2000, climate change as projected then by IPCC would result in benefits of up to $23B/year to agriculture and forestry. An extensively referenced 360-page book ”The Many Benefits of Atmospheric CO2” by the Idso’s lists fifty-five benefits of atmospheric CO2 enrichment. In other words, researchers have yet to find evidence of more-extreme weather patterns over the period, contrary to what the models predict. “There’s no data-driven answer yet to the question of how human activity has affected extreme weather,” adds Roger Pielke Jr., another University of Colorado climate researcher. Given the unknowns, it’s possible that even if we spend trillions of dollars, and forgo trillions more in future economic growth, to cut carbon emissions to pre-industrial levels, the climate will continue to change - as it always has. Indeed, despite all the claims to the contrary based on seriously contaminated surface data from global networks that are increasingly urbanized and poorly maintained, the data itself doesn’t support the CO2, global warming hypothesis. We have shown that even for version 2 of the USHCN data set for the United States, correlation with NOAA ESRL CO2 data shows an on again off again correlation of temperatures with CO2 since 1900. In fact during periods totaling 64 years correlations have been negative (temperatures fell as CO2 increased) while only 44 years had the positive correlation claimed as proof of the connection been positive. 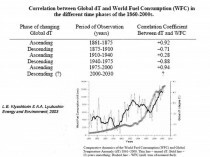 The Russian scientists Klashtorin and Lyubushin (2003) found a similar alternating pattern comparing GLOBAL temperature trends and World Fuel Consumption. They found a +0.92 from 1861 to 1875, a -0.71 from 1875 to 1910, +0.28 from 1910 to 1940, -0.88 from 1940 to 1975, +0.94 from 1975 to 2000. They found going back to 1861, that 69 years had positive and 80 negative correlations. In the paper they projected a reversal post 2000 which has verified. This on again, off-again correlation clearly suggests that CO2 is not the primary climate driver. So real data - not models tuned for the desired result - suggests CO2 is not correlated with temperature changes, is not harmful to health, is instead beneficial to plants and thus mankind.